A wind-less, cloudy morning saw the north end of the Island visited and after the storms of the previous day there were plenty of sea-birds exiting the north sea and passing by the sea-watch hide. An hour long sample count saw 374 Kittiwakes, 170 Fulmars, 75 Auk sp and 2 Red-throated Divers moving west. A juvenile Glaucous Gull showed well on the shore at Garso and a single Pink-footed Goose was with Greylags in the fields nearby. A Kestrel was seen again (present throughout January), as was a Snow Bunting and an impressive 155 Twite had built up in the Observatory crop fields. After the near 80mph winds overnight dropped to a more bird-able 50mph during the day, a few hours were spent checking the leeward Eastern side in the afternoon. The big surprise of the day was a Stock Dove near the Mill. Usually appearing singularly in early spring or late autumn, this is the first 'winter' record of the species on the island. There was little else of note seen, with Gull and Wildfowl numbers remaining much the same but there were now 2 Pochards present. With a calm morning and the return of ornithological staff, the south east of the Island was birded thoroughly for the first time in a while. There were large gatherings of Gulls and Wildfowl feeding in the swell, but the surprise of the day was a flock of 13 Black-tailed Godwits on Bridessness Loch representing the first January record for the Isle.With only one previous record each for December and February (both of singles), this 'flock' is particularly unusual and it will be interesting to see if they remain for the rest of the winter. 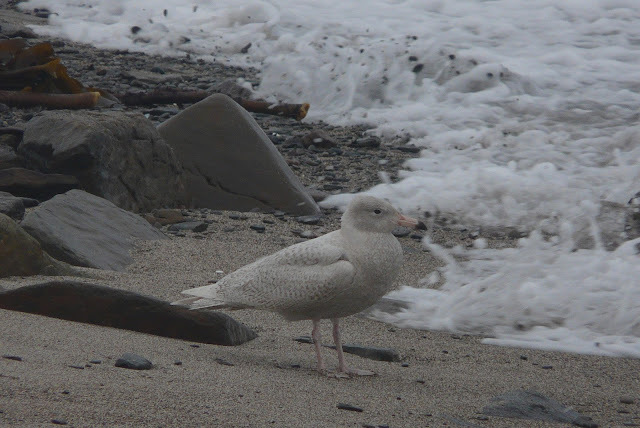 Among the 370 Common Gulls and 150 Herring Gulls present was a single adult Lesser Black-backed Gull (only the 3rd January record) and 3 Black-headed Gulls while 'white-wingers' were conspicuously absent after the events of last winter. 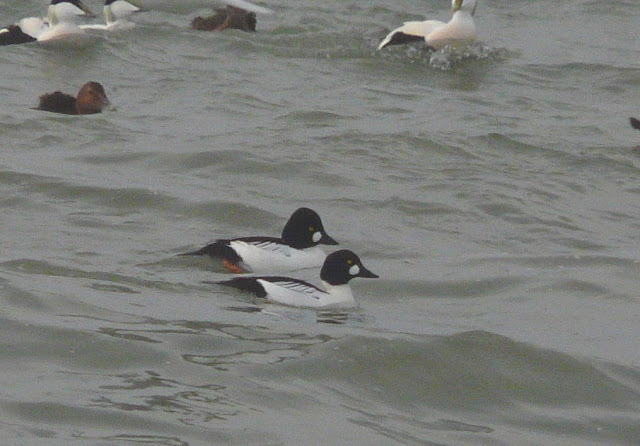 Wildfowl highlights among many Eiders and Wigeons, were 4 Shelducks, 4 Shovelers, 2 Goldeneyes, 5 Tufted Ducks and a single Pochard (although the northern Lochs were not counted today). 40 Fieldfares and 11 Redwings were in the fields and a Song Thrush was in Holland House gardens. The cold snap last week has obviously brought a few finches in, as there were at least 97 Twite and 32 Linnets in the Observatory/Holland area. Also of note, an unseasonable Ring Ouzel seen in Holland House gardens last week was only the 2nd 'winter' record for the island, the previous one being in January 2009.